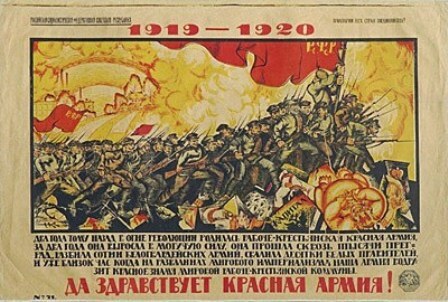 Various sectors of the Russian population were increasingly compelled to take to arms to defend themselves against the strong-armed tactics of the new Communist dictatorship. As for the Bolsheviks, they did not see a civil war as anything out of the ordinary. The Communist leaders considered the armed confrontation of antagonistic political and social forces as a justifiable and legitimate form of “class struggle.” Millions of armed, embittered, and illiterate workers and peasants turned a ready ear to revolutionary agitators, who stirred up class hatred and incited mobs of boorish soldiers and sailors to senseless acts of violence. From mid-1918 on the fighting escalated into an all-out war waged by diverse armed units: from regular armies to numerous guerrilla detachments and bandit gangs. Some thought of themselves as “Reds” (the traditional color of Communist revolutionaries), or pro-Bolshevik; others joined the “White” (the traditional color of the conservative supporters of the old order) movement that united diverse anti-Bolshevik forces from monarchists to socialists. Others still, including many members of moderate socialist parties, found themselves vacillating between the Bolshevik commissars and the White generals. Finally, there were disparate peasant detachments operating in different parts of the country that switched sides between the Reds and the Whites or even fought against both of them. The civil war dragged on for nearly three years until the end of 1920, imposing even greater hardships on the Russian people than those of the world war. Ultimately, the loyalties of the peasantry that formed the bulk of the population proved decisive for the outcome of the civil war. To the majority of peasants, the agrarian policies of the White governments were unacceptable, because they wanted to reintroduce the old property rights of the landed gentry on the territories under their control. The peasantry had to choose between two evils: the grain appropriation and the ban on free trade, imposed by the Bolsheviks, or the restoration of the gentry’s property rights. The Bolsheviks seemed to many to be the lesser of two evils. The peasants were convinced that the land that was given to them as the result of the revolution would remain theirs in case of a Bolshevik victory, whereas the Whites’ victory would almost certainly mean the repossession of the land by former owners. The peasantry’s pro-Bolshevik leanings enabled the Communist authorities to boost the strength of the Red Army to five million men toward the end of the war. The maximal strength of the White armies during the civil war did not exceed 800,000 men.